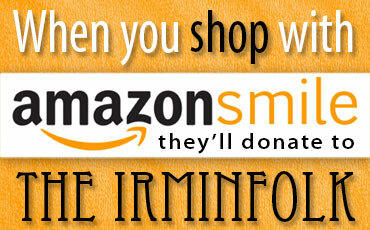 By the unanimous vote of the Board of Directors, the Irminfolk adopted its crest on December 31st 2010. The crest is formally registered with the United States Library of Congress. The Crest of the Irminfolk Odinist Community consist of a Man (Dexter) and women (Sinister), depicted in traditional peasant garb, standing “Respectant” (facing each other) supporting an Irminsul atop a “Compartment” having the word IRMINFOLK lettered in Runes. When the Crest appears in color, the Irminsul and the Compartment are Gold. The man and woman will appear as either white (if the background color is dark), or Black (If the background color is light). When the crest is “charged” on an Escutcheon, it is a round-bottom shield having a solid field of Black and a Bordure of Gold. Symbolically the man and woman represent the Folk, who are borne atop the Irminfolk which roots them and provides their organizational vehicle. They carry and support the Irminsul, a representation of the Cosmic World Axis both connecting and separating Heavens and Earth. It stands above them, stabilizes them, focuses their energy, and shelters the folk beneath its outstretched limbs. The Irminfolk employs a Bindrune as its House Mark. Apart from the Crest which is complex and colorful, the House Mark is easy to remember, and easy to cut, scratch, draw or engrave. It does not have a color. It is intended to mark the physical property belonging to the Irminfolk Odinist Community. The House Mark Bindrune is made up of three Younger Futhark Runes: Yr, Man, and Sol. Yr-Man-Sol alludes to “Irminsul”. The Bindrune also represents the Yggsdrasil. Yr, the 16th rune of the Younger Futhark and the Armanen Futhork represents both the yew and matter, power and destruction. It was used on the grave stones as the “Todesrune” to indicate the date of death. Man, the 14th rune of the Younger Futhark row. It represents divine ancestry, consciousness, and day. It was used on gravestones to indicate the date of Birth. Sol, the 11th rune of the Younger Futhork is named Sig in the Armanen Futhork, Sigel in the Anglo-Saxon Futhork and Sowilo in the Common Germanic Futhark and represents the sun, the sunwheel, solar power, victory, knowledge and success. At Folkish Summer Hallowing 2013, the Irminfolk ceremoniously dedicated its Vexillum (banner). 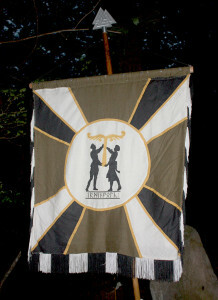 The Irminfolk Vexillum is a Banner made of natural flax linen. The field is Green with eight “inactive” (meaning straight as opposed to wavy) “Gyrons”, or radiating triangles, alternating between Black and white and divided by Gold fimbriation. On the Obverse It is charged in its center with a white disk to symbolize a full moon (or the White Light of Mani) with the Irminfolk Crest centered on the Disk. The reverse of the banner is the same field and Gyrons with a white Disk except it has a Valknut in Laurels (with 14 oak-leaves and 8 acorns) under a motto (in Runes) WOTAN MIT UNS. 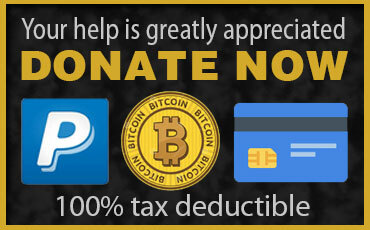 The obverse design represents the community. The reverse is a commitment and invocation to Wotan and a reminder that behind the community there is a War God. Taken together, it signifies an Odinist community that would fight, not because it hates what is before it, but because it loves what is behind it. The banner is Nailed to an oak crossbar with nine Sunwheel-head nails. Each Sunwheel nail signifying one of the nine worlds, the nine virtues, and so on… (Nailing of a flag is a gesture of defiance. Because Striking ( or taking down) a flag is a sign of surrender, a flag that is nailed to its mast indicates there is no intent to surrender. It is gesture that we intend to see this through to the end.) The crossbar is suspended from a staff topped with a metallic silver Valknut.